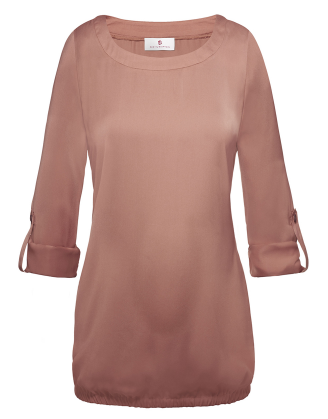 You'll find this elegant dressy top a great choice for many occasions. Lovely bateau neckline with blouson bottom will work great with pencil skirt or slacks or under a blazer. Some of the other fine details include a faux button at the center of the sleeve and a tie at the end of the sleeve.